KAANCHI starts off very well, with Ghai capturing certain moments that stay with you. The first hour has several engaging and interesting episodes, while the twist in the tale that leaves Kaanchi shattered is the highpoint of the movie… one expects the post-interval portions to only go forward from this point. Sadly, KAANCHI hits a rough patch in the second hour. On the whole, KAANCHI could’ve been a riveting fare, but doesn’t rise beyond the ordinary in the final tally. Subhash Ghai has penned a tried and tested story of a wronged girl out to seek revenge against the rich and mighty. His screenplay, like the story, may not offer much novelty but he scores with his characterisations. On the whole, Kaanchi is an entertaining fare but its terribly dull start is a dampener because a major pick-up is ruled out for three reasons – absence of star faces in the romantic lead, absence of any novelty in the script, and absence of superhit songs in a film introducing a new girl. It will, therefore, entail heavy losses. From effortlessly epic to unintentionally campy, Ghai’s school of entertainment has taken quite a beating. I walk out hastily from the screening, having witnessed a particularly ridiculous final combat, hoping to erase Kaanchi’s absurd imagery and phoney politics with the thumping nostalgia of dhina dhin dha. Now that loyalty, that’s unbreakable, Mr Ghai. Patriotic intentions apart, a lame love story with limp kisses follow. Before Kaanchi and Binda embark on their journey of bliss, the antagonist Sanjeev Kakda (TV hottie, Rishab Sinha), who desperately needs a haircut and acting lessons, comes into the picture. Coming back to the plot, Kakda is infatuated with Kaanchi and when she resists, he recoils. From here the film descends into a mishmash In what is the most childish plot ever. And by the time she’s done with her Mother India act, you’re too tired to seek reason. Subhash Ghai seeks to connect into the rising tide of anger among today’s youth with narrative devices that have seen better days. Kaanchi is essentially the doomed love story of a simple girl from an Uttarakhand village of retired soldiers. It works only till a point. The revenge motive that rides on the heroine’s rage fails to acquire any kind of urgency. The bid to link her personal mission to a people’s movement on the streets of Mumbai is also rather laboured. Kaanchi is strictly for old time’s sake. A fiery young girl from the hills takes up cudgels on behalf of her people and fights off the bad guys. This is the burden of Subhash Ghai’s new film, and he tells it in the same manner that made his films so watchable in the ’80s, and so out-dated in 2014. This may have had power 40 years back. Now it is just tired, and jaded. The plot is so naïve that most of the audience was laughing at Kaanchi`s antics rather than supporting her in her movement. All in all, `Kaanchi` does not work on any front. Watch the movie at your own risk. But spare a thought for Ghai – it breaks your heart to see a showman fail to produce a good show. 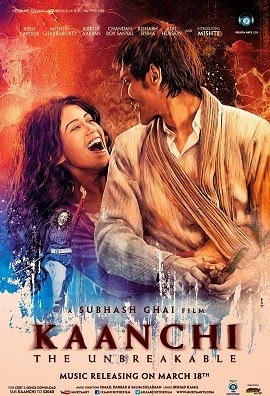 Kaanchi is a film that may entertain you if you are a fan of Subhash Ghai films. The script is not strong enough to make this film a riveting one. There are no stellar performances to look forward to. Also the music or the background score do not really help to pick up the film at any point. The film has typical Ghai film elements with a small town feel and yet the extravagance of the elite. The film could also serve as an inspiration to girls who want to bring a change in society but only in a cinematic manner. Watch it if you have ample of free time!